Conceal.Network is a decentralized blockchain bank, with deposits and investments paying interest rates, without involvement of financial institutions, powered by 100% open source code. Conceal.Network enables untraceable and anonymous messaging, and a secure way to transfer funds. Using a distributed public ledger, the sender and receiver are kept anonymous, a key concern in a post Snowden world. Hackers cannot trace money or messages when the messages are sent across public networks. Conceal Cryptocurrency (₡CCX) is based on the Cryptonote protocol and runs on a secure peer-to-peer network technology to operate with no central authority. You control the private keys to your funds. Conceal is accessible by anyone in the world regardless of their geographic location or status. Our blockchain is resistant to any kind of analysis. All your CCX transactions and messages are anonymous. Conceal avoids many concerns, e.g. technological, environment impact, reputational and security, of Bitcoin, and provides a glimpse of the future. Conceal is open-source, community driven and truly decentralized. No one owns Conceal, everyone can take part. At Conceal, we believe that access to knowledge is what truly allows great ideas to flourish and diverse communities to grow. We believe that Conceal is what the community decides it to be and that decisions on how to grow the protocol should involve everyone. Conceal follows Satoshi Nakamoto's original vision of decentralised, trustless cryptocurrency, i.e. a secure digital cash operated by a network of users. Transactions are confirmed by distributed consensus, and then recorded on the blockchain immutably. Third-parties do not need to be trusted to keep your money safe. Conceal is truly fungible, thanks to built-in privacy features. Just like cash, all coins are equal, changeable. It is extremely unlikely that a coin will ever be blacklisted by any party due to its association in previous transactions. Future scalability initiatives will include a modular sidechain. Easy to use Desktop and CLI clients. Deposits get up to 4% interest rate per year and Investments up to 12% p.a. Starting on 5 CCX and going up to 20 CCX (+0.25CCX/month). Currently 7.5 CCX. Wallet addresses are a string of 98 characters starting with "ccx7"
Deposits form the backbone of the Conceal ecosystem, providing users with an egalitarian form of staking that earns interests on locked deposits. Conceal Investments provide higher interest returns for longer term holders. A true decentralized, anonymous, untraceable, and end-to-end encrypted messaging service that operates on the blockchain while allowing messages that self-destruct. Future releases will include web and mobile messaging applications. 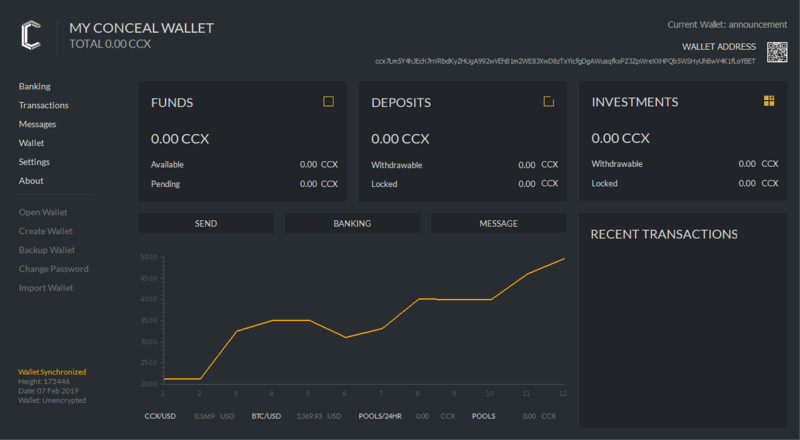 A deposit system that generates interest when locking CCX down for a specific term. Interest is released at the end of the deposit term. Switch to the Cryptonight-Fast protocol developed by Masari to secure against malicious network attacks, while maintaining the balance between the CPU and GPU miners. Send and recieve encrypted messages using the blockchain from the Desktop Wallet with support for self-destructing and large messages. Implemented the algorithm that is one of the best to combat hasrate based attacks on the network, providing speed of response and network stability. A new improved Desktop wallet redesigned from scratch and offering better privacy protection, deposits, encrypted messages, market information, price charts, and pool earnings. With the addition of the Investments module, Conceal users will be able to earn additional interest when they stake more funds for longer. An upgraded deposits module will allow additional granularity and a new interest rate scheme will replace the existing flat rate. A simple one-click miner that supports GPU and CPU mining. All the user will need to do is enter an address, select a pool and click Start. The first step to mass adoption and the backend nessecary for the development of the mobile wallets, is the introduction of a server-side cloud wallet. The Cryptonight Conceal variant has tweaks that involve minor floating point math. This is not enough to prevent FPGA implementation entirely, as that involve significantly slowing down CPU mining, but it will discourage it. It also includes an accumulating constant to make sure that each transformation is done in order. The transformation is applied right before AES encryption. The fortress update is an ongoing initiative to improve the privacy of the network while maintaining network speed and performance. We will start with the Android wallet with future plans for iOS development. Alias Protocol implementation to simplify aliasing for users unfamiliar with cryptocurrency while keeping it private, decentralized, and secure. Remote nodes are an important part of the network expansion and we are implementing a fee model to reward whoever runs them. Get CCX rewards for shopping online. The protocol will adjust interest rate dynamically based on several network factors such as deposits and investment penetratation, and current supply to reduce inflationary risks. The Conceal Desktop Wallet is the central point of interaction of all the features of the currency. With the wallet, you can send and receive CCX, send and recieve encrypted secure messages, manage your deposits and investments. The wallet is available for all major platforms: Windows x64, Ubuntu, macOS and Arch Linux. The easiest way to mine Conceal with CPU's or GPU's is to use one of the many miners that support Cryptonight-Fast or use our Conceal Miner. The best place to find out more is to visit our Discord channel. You will find our source code, and other releases on Github, and our latest activities on Twitter. Here are all the other ways you can find us online. ©2018-2019 Conceal.Network. All rights reserved.